The Cayuga Community College Alumni Association recently honored two alumni for their outstanding contributions to the college community. The 2013 Alumni Awards went to Patricia M. Callahan ’87 and Michael R. Frame ’99. Cayuga Community College 2013 Alumni Award recipients are Patricia M. Callahan ’87 of Skaneateles and Michael R. Frame ’99 of Syracuse. Callahan began her studies at Cayuga as a nontraditional student after her children were grown. She has established two scholarships at Cayuga Community College – the Patricia M. Callahan Scholarship in appreciation of her two-year experience at College, and the V. H. and P. M. Callahan Scholarship in recognition of her own success and fulfillment as a transferring, nontraditional student at Empire State College. 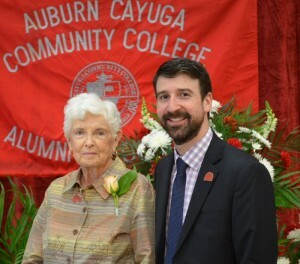 She continues to support the College Foundation through her generous giving, and always encourages those interested in advancing their education to attend Cayuga Community College. Upon completion of his master’s program, Michael Frame of Syracuse became federal relations assistant and policy analyst for the California State University system in Washington, D.C. He then returned to New York and served as director of special projects for the Metropolitan Development Association in Syracuse. Since 2011, Frame has served as director of federal relations for the State University of New York, as well as the director of federal relations for Binghamton University since 2006. Frame has served as director of federal relations for the State University of New York, as well as the director of federal relations for Binghamton University since 2006. Established in 1993, Alumni Awards are presented annually to Auburn/Cayuga graduates who have made outstanding contributions in vocational or artistic achievement, volunteer or public service, or assistance to the college.